Federation Type-7 Shuttle which can be claimed in the Promotions tab of the C-store. Skant Uniforms which can be claimed in the Promotions tab of the C-store. 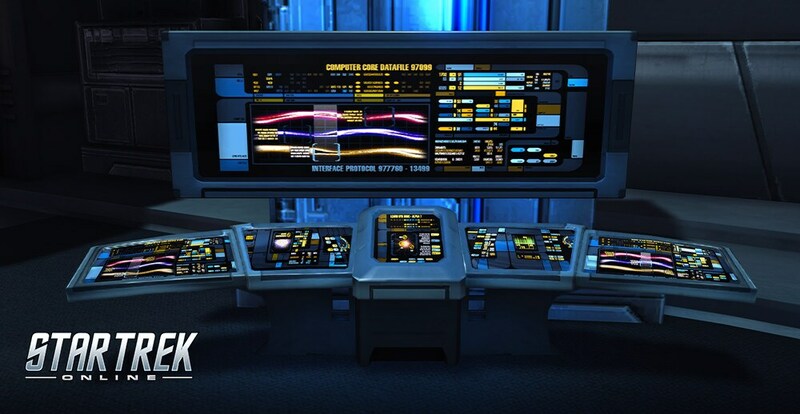 Visit Worf for some free items in the Holodeck of Starfleet Academy or the Klingon Academy! The previously released TNG 25th Anniversary event has returned in celebration of the 30th Anniversary! Players who previously claimed these rewards will not have new rewards to claim. Romulan players cannot claim these rewards. For participating in the Kobayashi Maru Weekend Event or any future Weekend Event, players will receive 1 Weekend Event Voucher per day. To access the store, either double-click on the voucher from the inventory or view the store in the Weekend Event Tab in the Events Store of the Reputation System. The current and previous Weekend Event rewards will be available for purchase. By popular demand, any purchase from the Weekend Event Store is account unlocked and can be reclaimed by any characters on an account! Please visit our blog for more details! Resolved an issue that caused some Federation ships to not have access to this interior. There is now an image of this interior in the Ship Tailor. The name of the interior in the Ship Tailor has been changed to; Galaxy (2368) – Galaxy. Added some weekend events to October. Resolved an issue that caused the VFX for Nanite Infection to remain on players even after the affix round for Nanite Infection ended. Added some additional audio to the mini-contacts in the queue. The difficulty curve has been adjusted to be more gradual for waves 1-10. There are still some Federation ships that cannot apply the new Galaxy (2368) Interior. Some male species have invisible legs when Skants are applied.